Something strange is going on in the neighborhood of New York as a large blue shockwave over runs the city causing ghosts to begin popping up everywhere. It isn't long before you, the Rookie, meet up with some old ghost favorites like Slimer and the Librarian. Egon, Ray, and Venkman (Winston shows up later) are all there to guide you through the tutorial in how to wrangle and capture a ghost. Whoa boy is ghost busting ever satisfying. You'll fire your trusty proton pack until the ghost is in a weakened state, it's at that point you'll switch over to the containment stream. Throw out the trap and wrangle that ghost in. The more Ghostbusters there are latched onto the ghost, the faster you can bring him down into the trap. To mix things up you can "slam" the ghost against walls and objects while trapped to weaken it further and stun it for convenient storage. All in all - it plays out exactly as an 8 year old boy imagined while playing Ghostbusters in his back yard. Ghostbusters features nearly fully destructible environments, and really gorgeous environments to boot. From hotels to the streets of New York, the graphics just pop off of the screen at you. The Stay Puff Marshmallow man looks so good you could eat him. Seriously. Just about every aspect of the graphics jump out at you. The ghosts in particular look great with plenty of "fun" varieties to capture. 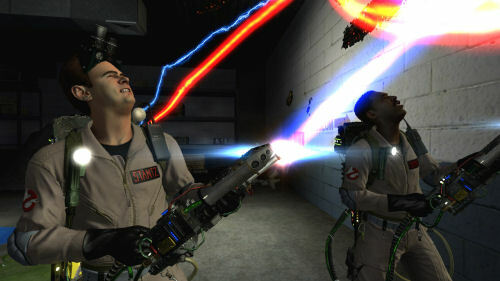 The classic Ghostbusters humor is present throughout the game, no doubt thanks to the writing of Ramis and Aykroyd. Really so far, there's very little to complain about with the single player game. Of course you're probably wondering how the co-op mode works and plays. I jumped into a few matches and so far it's pretty decent, if a bit lacking in terms of depth. You'll start with choosing a character and base persistent weapon type. Each campaign contain three missions of varying types. These range from survival, time based capture, protect the artifact, or destroy the artifact. There's also a "Slime Dunk" mode - though it's a bit more competitive than cooperative. Some of the modes like time based capture are absolutely crucial to communicate, or else it simply takes too long to capture the ghosts and you'll run out of time. Throughout the small maps various weapon powerups will spawn that you can pick up, these vary from shotgun style proton shots to a slime gun. All of these are also available for purchase in single player. As you complete missions you'll earn money which upgrades your characters ability based on your weapon. Like I said, there seems to be a lack of depth though, and with only four campaigns in co-op things might get stale. Because the better you do, the longer they last, it's hard to quantify a length in the co-op. The first match I played in only had me and one other player and we ended up finishing the campaign in about 10 minutes. Of course we also didn't get very much cash for that. Another campaign with three players lasted almost 20 minutes. The cash doesn't really get you anything, other than moving your position up the leaderboard. Overall it's pretty fun, but it doesn't make up for the lack of a true Ghostbusters Co-Op Campaign. We'll bring you a full review of the Ghostbusters co-op mode later next week. Don't forget to check out are Co-Op Ghostbusters giveaway with some great exclusive swag!